ABC Visual System is fully tailored and customized with simple and easy to use software of your business. Special through glass sensitive film that is applied to inside of glass, leaving only glass to be accessible from outside the shopfront, thus having a vandal proof frontage. Works through glass up to 20mm thick, acrylic. 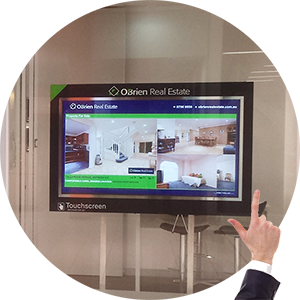 Different sizes are available from 32" to 80"
Content is derived from your existing property data provider, there is no need to upload separately into ABC Visual system. An all in one amplifier/computer system directional speaker automatically adjusts its volume output with the built in SmartVolume technology ensuring audio is never too loud or soft. It’s like having a full-time employee controlling the volume. The sound has directional dispersion, this means standing in front of the speaker gives the clearest and most audible sound, whilst standing to the side the audio is greatly diminished. 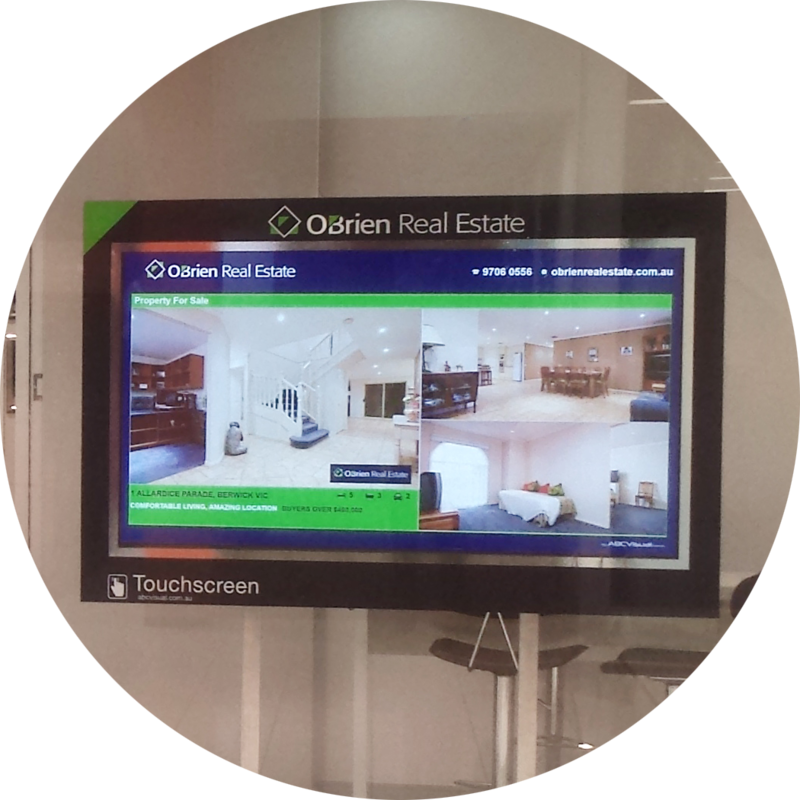 Audio and windows projector system coupled together with controller creates an eye catching large display that sets your location apart from the competition. The format and style of the front end is fully tailored to match your corporate colours and image. 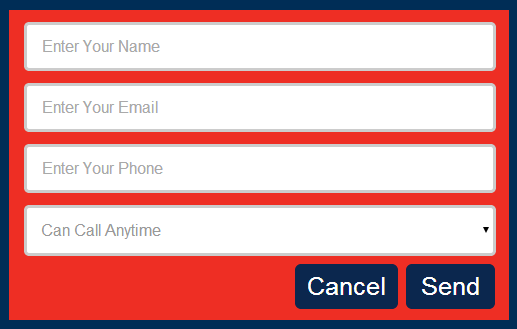 The content is able to run in zero maintenance mode, or at most very simple turn off/on properties to be displayed as all property data is automatically loaded from your current website data provider thus not having to upload property data and photos multiple times, it’s as easy as ABC. 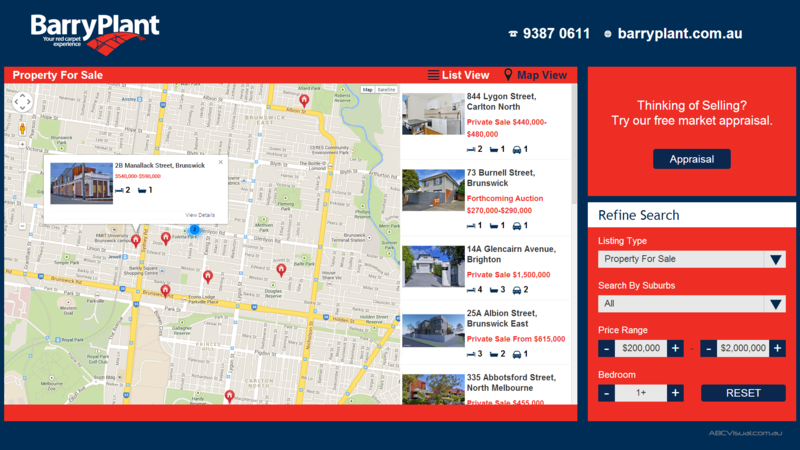 Property location map is displayed as well as other properties in area. 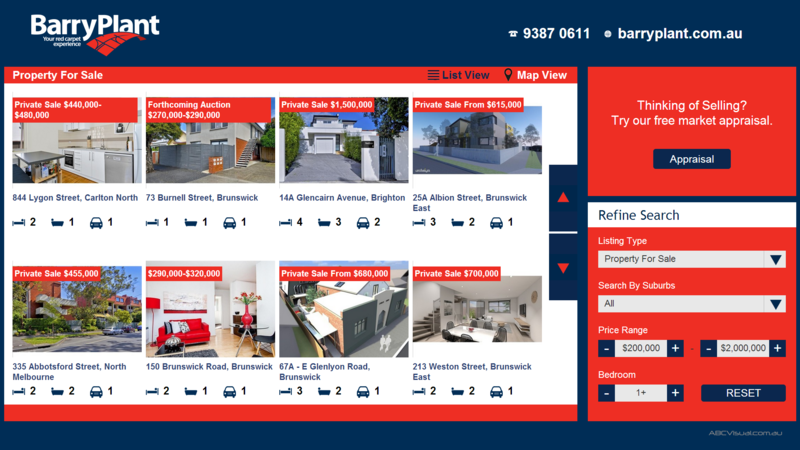 Once the screen is touched, a default easy to follow property list appears. 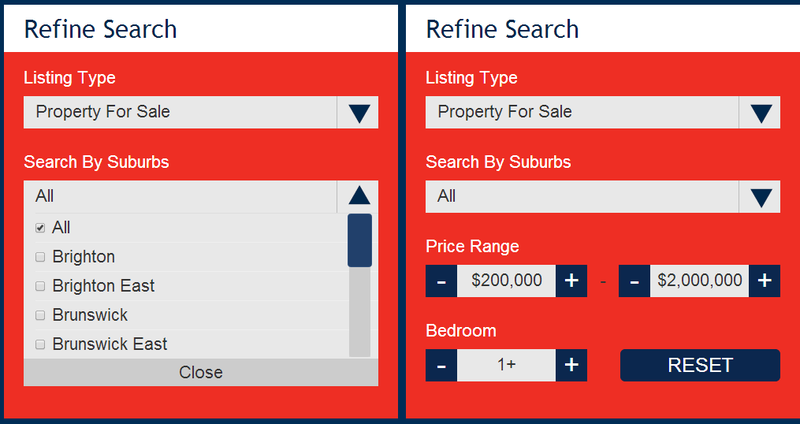 Other properties in area may be viewed and selected. Easy to follow criteria may be entered. 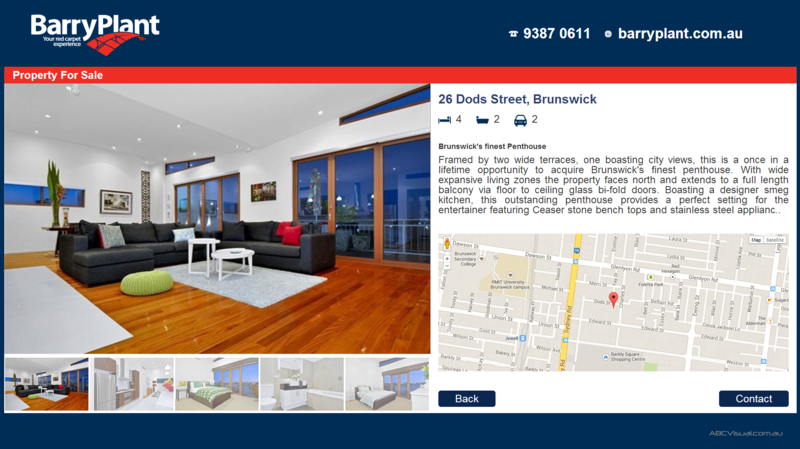 Once a property is selected more detailed information is shown with location map as well as opportunity for customer to enter information for the agent to make contact. No activity timeout will automatically cycle through properties and/or advertisement when the touch screen is not in use after 60 seconds. 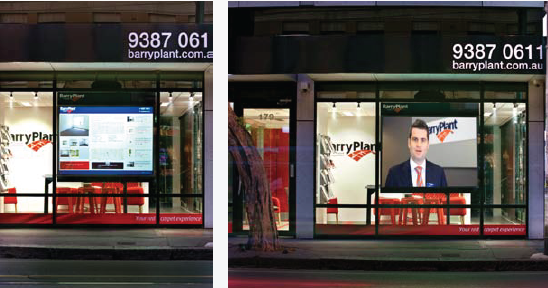 All software is developed in house and tailored to your needs to maintain branding and corporate appearance. Mounting hardware is also designed and manufactured in house, to provide a pleasing and matching blend into premises, colour options are available as well as stainless steel mounting. 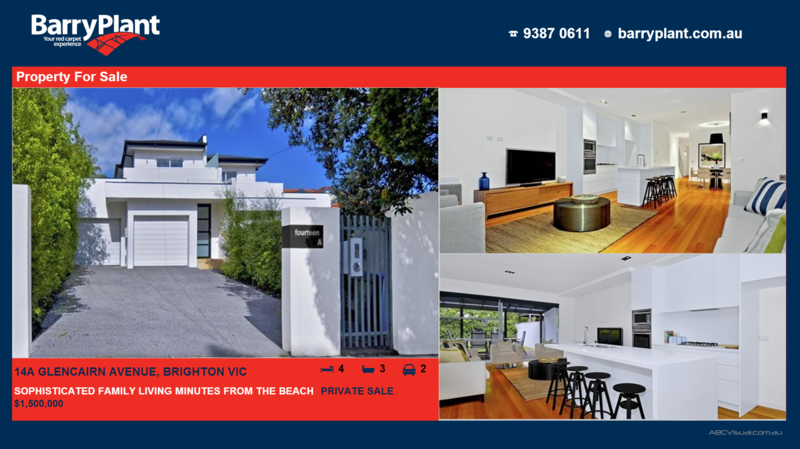 ABC Visual created its business strength and foot print within the real estate industry from referrals and recommendations of past and existing cliental. We also have a huge foot print within the commercial industry (non real estate) also. Our customer service is second to none and we aim to meet and fulfil the business requirements of all our clients. 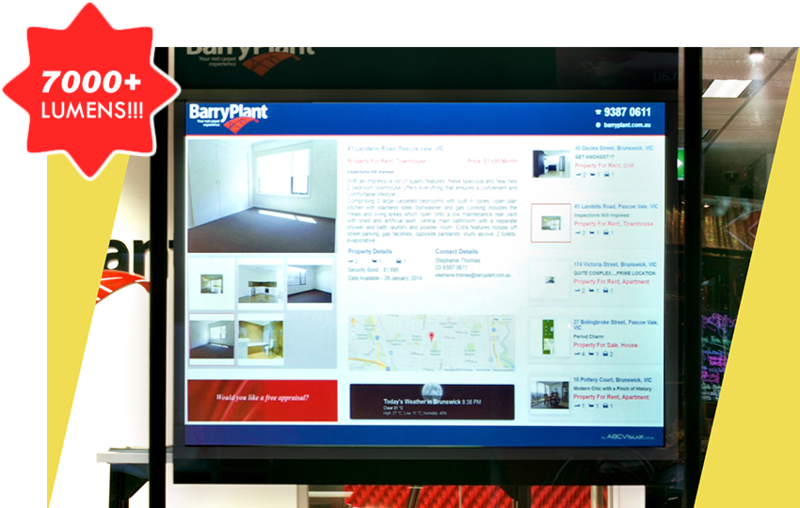 As specialists in digital signage and integrated technology solutions, we have been supporting businesses of all sizes across Australia. So whether you’re a small start-up or medium to large company we have the solution for you. Please do not hesitate to contact us for any queries and or information. 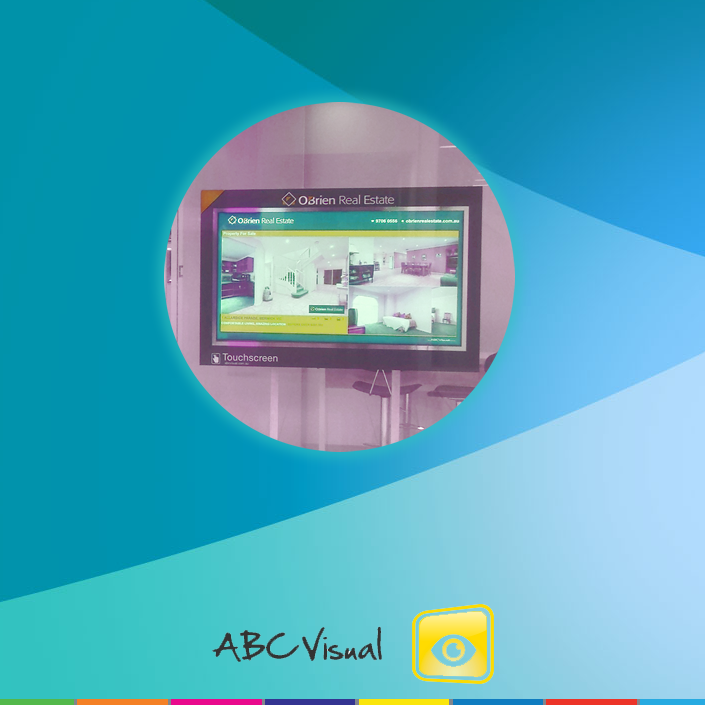 ABC Visual, is a digital signage and integrated technology solutions provider. We build and develop advertising solutions, integrating best design practises and up-to-date web technologies to create great user experiences. We would love to hear from you ! Copyright © 2014 ABC Visual Pty Ltd / All rights reserved.